Authentic PG Tips is still made in Manchester, England. A picture of the plant is below. 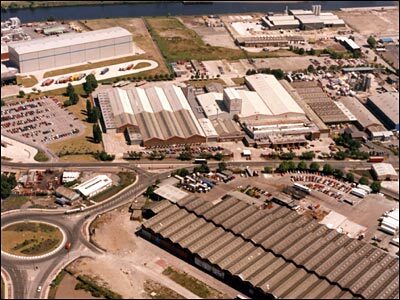 PG Tips plant in Manchester, England. Make sure you get authentic PG Tips Tea. I’m quite interested about the teabag. So i have some questions i would like to ask. Where is the mesh of the teabag created? From what? And originally from what? Where are the tealeaves from originally etc. Before being imported into London, what process do they undergo? or if they arer made in manchester as some sites suggest where are the materials attained from? What countries does the the teabag travel through before finally reaching the homes of the UK? We were not able to find out the answers to all your questions. This is specific company info we have not found anywhere. Sorry. Hi, Do you use a lower grade of tea in your catering packs as it never tastes as good as the smaller packs? My colleagues are under the impression you may put the ‘sweepings’ in the catering packs, Is this true?